The Kansas general fund revenue stream is not large enough to cover even a scaled-down, conservative set of expenses, and the problem lies squarely with the income tax. Earlier this month, Kansas revenue estimators lowered the forecast for FY 2016 and FY 2017 revenue. They revised their previous estimate of sales tax receipts downward sharply, but only dropped their estimate for income tax collections slightly. This caused some observers to say, “See, sales tax is our problem, income tax receipts are doing fine.” But that is a big analytic miss. The only reason that income tax receipts are close to meeting “expectations” in the first four months of FY 2016 is because the expectations have by now been set amazingly low. Travel back just a few years. 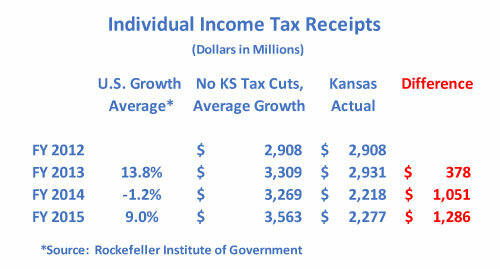 In FY 2012, Kansas received $2.908 billion from individual tax collections. Then in FY 2013 the Brownback income tax cuts started to kick in. The tax cuts only affected a portion of that fiscal year, so tax receipts still grew 0.8 percent to $2.931 billion, but in that same year nationwide, the average state benefitted from a 13.8 percent income tax receipt increase. The Kansas tax cuts hit full force in FY 2014. Income tax revenue plummeted 24.3 percent, a $713 million drop down to $2.218 billion. Other states experienced weak collections in FY 2014, with the average state down 1.2 percent, but nothing like the catastrophic drop in Kansas. In FY 2015, Kansas income tax collections barely inched up, growing 2.7 percent from their rock bottom FY 2014 level, while other states experienced 9.0 percent average growth. During the last legislative session, lawmakers eliminated most income tax deductions and offered a tax amnesty to pull in delinquent payments, and so estimators now expect income tax receipts to reach $2.450 billion in FY 2016 and $2.485 billion in FY 2017, but still hundreds and hundreds of millions below where receipts once were. What if Kansas had not changed income tax policy? Instead, what would have happened if our income tax receipts had grown at the average national pace? Take a look. In FY 2015 Kansas would have collected $3.563 billion, well over a billion more than we actually received. 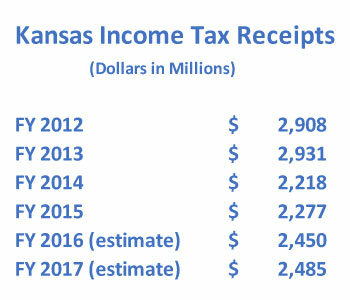 By this measure, Kansas has given up $2.715 billion as a result of income tax cuts in FY 2013 through FY 2015, and we are on pace to give up another billion-plus in FY 2016. 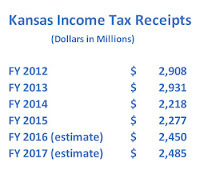 Although we cannot know exactly what might have been, it is quite plausible that Kansas income tax receipts would have grown at the national average. 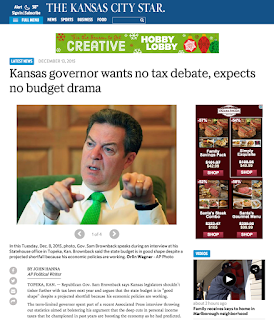 If the income tax cuts had never occurred, the Kansas budget would easily balance today. The sales tax rate would be at 5.7 percent, not 6.5, the state would have reserves, and with careful management there might even be enough resources to lower the sales tax rate on food. But that’s only a dream now. Kansas produced a self-inflicted financial crisis. The way out of it is to go to the source of the problem: income tax cuts.